Welcome to Fox Ridge subdivision in Delta Twp. This 2005 parade home was built by Dible builders – one of the most sought after builders in the area. This ranch style home has all the upgrades and custom designs that you’d expect from a Dible built home. It features Aristokrast kitchen cabinetry, and includes a GE appliance package including a spacemaker microwave. 3/4″ Armstrong laminate flooring with foam underlayment sound solution package. Split floor plan with the Master bedroom bath suite on one end of the home featuring cove ceilings, walk-in closets, dual sinks, and an over-sized master shower. In the living room you’ll enjoy the open cathedral ceilings with majestic gas fireplace. This home is energy efficient with a high efficiency furnace and water heater. this home has a multi-tiered deck which over looks the large back yard, and the basement has plumbing for a third bath, three daylight windows, and is completely wired for finishing. Come experience this quality built parade home today! For additional information and photos on this property click here! 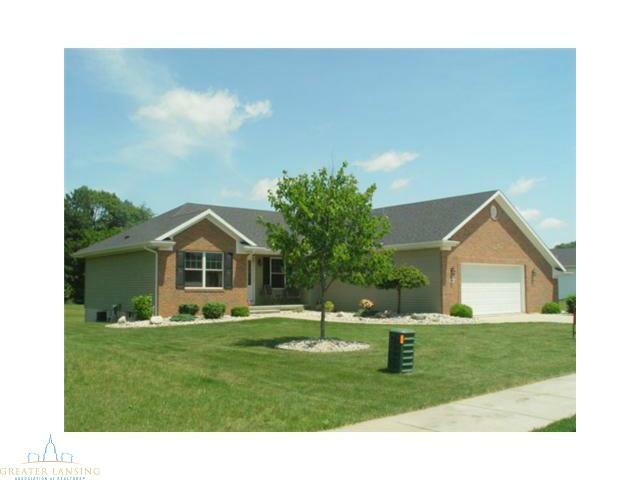 Posted on April 8, 2014, in Grand Ledge Featured Listings, Grand Ledge Listings. Bookmark the permalink. Leave a comment.